Being an avid Toronto Blue Jays fan, a proud member of the Ontario Dental Association (ODA) and a committed Board member of AboutFace, an organization that advocates on behalf of people affected by facial difference (www.aboutface.ca), I was terribly disappointed to miss the AboutFace Night held at Rogers Centre in Toronto on May 14. 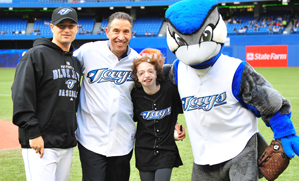 Because this special night coincided with the ODA's Annual Spring Meeting, a ceremonial joint first pitch was organized involving Dr. Ira Kirshen, then ODA president, and Katie Atkinson, a young client of AboutFace. I missed the evening because I was in Ireland for my 30-year dental school class reunion—a one-of-a-kind event for an expatriate, you will agree. One of the nicest stories described how Katie was very nervous about throwing out the first pitch, worried that she would make a fool of herself in front of the crowd. Sensing her nervousness, Dr. Kirshen proceeded to calm her down and promised to accompany her the whole way. The report is that Dr. Kirshen became an instant admirer of Katie's quiet, determined nature and is happy to call her a friend after their brief encounter. For me, this demonstrates the gentleness of a man with a caring spirit, an attribute characteristic of most dentists I know, and the reason many of us joined the profession in the first place. Katie will never forget the experience, not least because of the gentle, caring touch of Dr. Kirshen. Another example of dentists showing their caring nature occurred in July when Drs. Betty Dunsmore and Sandy Mutchmor (the current president and immediate past-president of the Manitoba Dental Association, respectively) formed a team to participate in AboutFace's "Leap-of-Faith" parachute jump fundraiser. Through generous donations from many dentists and members of the dental industry, the pair raised approximately $10 000 for the organization. These Manitobans told me afterwards that the thrill of the parachute jump was matched by the feeling that comes from helping out such a good cause. However, they wished more people in our profession knew about AboutFace and the work it does in supporting families and people with facial difference. This culture of caring, manifested so clearly by Drs. Kirshen, Dunsmore and Mutchmor, is ingrained in most dentists, even if the pressures of everyday life can sometimes distract us from time to time. The generosity shown by dentists is what makes ours a healing profession and what grants us so much respect as individuals in our local communities. The new JCDA wants to celebrate, promote and enhance the strong sense of volunteerism in dentistry through a new online forum (www.JCDA.ca/discussions). Here, we hope that dentists will share their experiences volunteering both in Canada and abroad. We want to provide dentists with a place to post volunteer opportunities that will also act as a clearinghouse of resources for potential dental volunteers. Of course, such a discussion forum will only come to life if dentists actively participate. I conducted a focus group with a small group of dentists recently, and many had experience doing volunteer dentistry in developing countries. They all agreed that it would be worthwhile to share their experiences with colleagues. When I asked about barriers to sharing these experiences on the forum, the dentists cited a lack of time, a reluctance to post on such a public venue, and a concern that they might seem too self-promoting. I believe we need to get beyond these very real barriers and show each other and society how dentists are helping to make our world a better place. I would love to hear from dentists who are interested in working with me to develop our new www.JCDA.ca/discussions forum into an example to the world of dentistry's caring spirit. On the JCDA cover, Vol. 76, No. 5: Ceremonial joint first pitch for AboutFace Night, May 14, 2010, at Rogers Centre in Toronto. 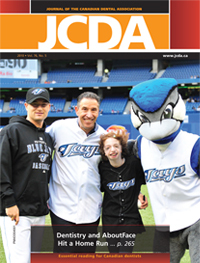 From left: Jason Frasor, Toronto Blue Jays pitcher, Dr. Ira Kirshen, immediate past-president of the Ontario Dental Association, Katie Atkinson, a young client of AboutFace, and Ace, Toronto Blue Jays mascot.